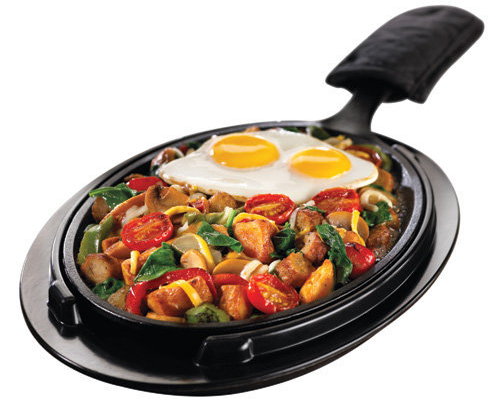 Anyone for Denny’s ultimate skillet? If you have a craving for hot pancakes or cheesy sandwich at 12 in the night, don’t worry the closest Denny’s restaurant is there at your service. I love their fluffy pancakes and have woken S in the middle of his sleep to drive me to the closest one to curb my pregnancy cravings. There were times even S will have cravings for hot pancakes in the wee hours and we will nod a yes in silence and head straight to our favorite place and to our favorite table too. During our road trips, Denny’s is our first choice of place to eat as they are open all the time and there is Denny’s every where. On a quick glace at the menu card, many like my mom would feel that the food at Denny’s is high in sugar and fat but for a person like me who has been on diet on/off (whether I succeed or not :-), I have explored their menu top to bottom. 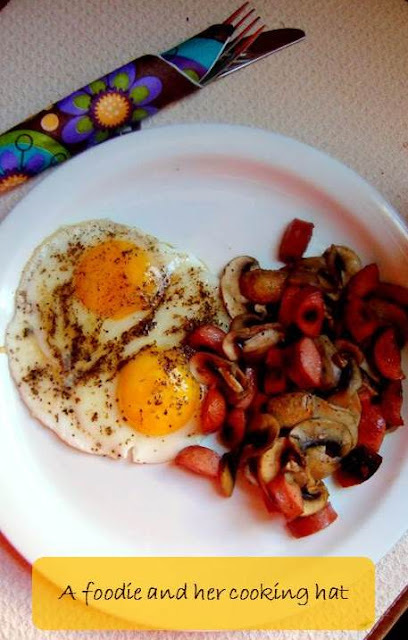 One dish which is filling and to an extent nutritious are their ULTIMATE SKILLET. Ultimate skillet is a dish served like a sizzler, cooked with fresh spinach, sausage, peppers, onions, mushrooms, tomatoes and red potatoes, they are super delicious and irresistible. They are served with two eggs cooked the way you want (I like them half cooked – Bull’s eye eggs) and topped with cheese. I have hopped between South beach diet phase 1 and phase 2 often. While ordering this dish, I ask them not to add the cheese and will skip the potatoes while eating. That way, I get to eat what I love and also stay within the parameters of the diet. On the practical front, it isn’t possible to eat at Denny’s all the time. So I re-created this dish in my kitchen with my choice of sausage (chicken and turkey) and omitted the cheese and potatoes. My verdict is this dish will be filling, will last through the entire morning and you feel less greasy and sleepy while you have a code to crack or a PCR to run or a meeting to attend. My attitude is if the tummy is happy, the brain will be active and this dish proves that. Heat a shallow non-stick cooking pan and add about 1 teaspoon oil. Once the oil smokes, add the diced sausage and cook till they brown, approximately 5-8minutes on a medium flame. Keep an eye to avoid burning. Remove and drain them on a kitchen towel. To the same pan, add very little oil and throw in the garlic. Saute for 30 seconds. 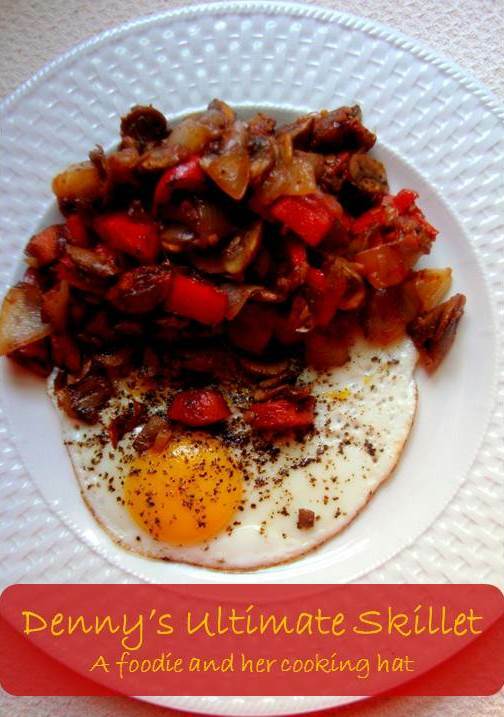 Mix in the onions, mushrooms, tomatoes and bell peppers. On a high flame cook them for 2 minutes. Lower the heat and cook till done, approximately 15 minutes. Add salt and pepper. Mix in the sausage. Set aside. Break the eggs and cook it the way you like. 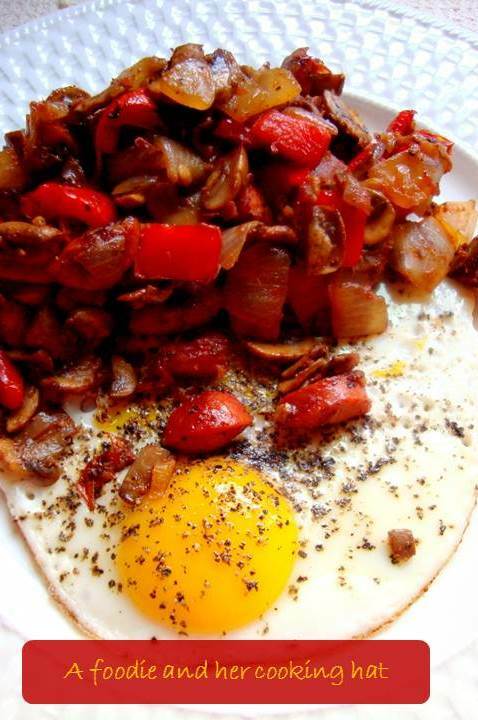 Serve the hot eggs with the veggies and sausage. Some days, I have fixed them with just mushrooms and sausage too. ← Food blogger’s bakesale – Join in! Am ready to finish that whole plate rite now,extremely irresistible..
o MY!!!!!!!! what beautiful pictures…. Feeling hungry after looking at ur plate. I would like to try some time. wow ! I love it! And i have all the ingredients ! yay! Totally delish looking! Want a big bite of that right now and I already had dinner! haha about your hubby's "pregnancy" cravings! I just break the eggs directly on top of the dish while still in cooking pan.. that way each piece gets coated with egg and Sanjit loves this dish. BTW we r going to make it for breakfasy today!!! My favorite dish at Denney's is the Chirio sausage skillet so I went on line to see how to make it! Thanks for your info!! !